MOSCOW, February 12. /TASS/. A decision of the Ukrainian national team to skip the 2019 FISU Winter Universiade in Russia is deeply regrettable, Maxim Urazov, the chief of the Universiade-2019 directorate, told TASS on Tuesday. February 2 was the deadline for submitting applications to participate in the Winter Universiade, which kicks off early next month. Ukrainian Deputy Sports Minister Igor Gotsul told TASS on February 4 that Ukrainian athletes would skip the international tournament in Russia’s Krasnoyarsk. 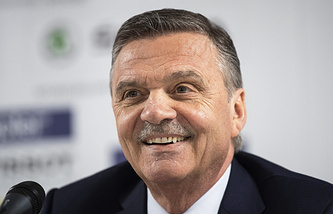 "We are open for everyone," Urazov said in an interview with TASS. "The Universiade was a chance for the whole world to discover Krasnoyarsk and Siberia, and we have been inviting everyone to be our guests and built the necessary infrastructure." "It is a pity that that they [Ukraine] did not use this opportunity to come to us, since the more countries involved the better and we are now expecting participants from 57 or 58 countries as the number is still being verified," he said. "The fact is that there is no data on athletes of Ukraine in the system of accreditation," Urazov added. At the 2017 Winter Universiade in Kazakhstan’s Almaty the Ukrainian national team finished 10th in the overall medals standings having won two gold, three silver and four bronze medals. The 2019 Winter Universiade in Krasnoyarsk offers 76 sets of medals in 11 sports competitions.